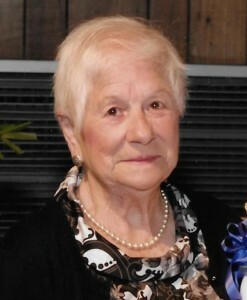 Northborough – Elizabeth “Betty” A. Tripp passed away Monday, March 7, 2016 at St. Vincent Hospital in Worcester after a period of declining health. She was 86. Her husband of 60 years, Harry Tripp Jr., died in 2007. She leaves her children, Elise Conlon and her husband Tom of Alton Bay, N.H., Jonathan Tripp of Oxford, Susan Bouckaert of Worcester, Wesley Tripp and his wife Marjorie of Palm Coast, Fla., and Jacqueline Kelly and her husband Scott of Worcester; 15 grandchildren; nine great-grandchildren; her sister, Barbara Wickstrom of Rochester, N.Y.; and numerous nieces and nephews. She was predeceased by her brother, William Sedelow Jr.
Born in Indian Orchard, Betty lived most of her childhood years in Worcester. She was employed at the former Thornton Nursing Home as head of housekeeping for 23 years. She continued working at Super 8 in Marlborough for 12 years, retiring in 2009. Years ago, she volunteered as a Girl Scout leader in Northborough. Betty and Harry spent 10 years traveling around the world. One of her favorite past times was bowling. A woman of great faith, she was a dedicated member of St. Rose of Lima Parish and was a founding member of the altar society. Calling hours will be held Sunday, March 13, from 1-4 p.m., in Hays Funeral Home, 56 Main St. Her funeral Mass will be celebrated Monday, March 14, at 11 a.m., in St. Rose of Lima Parish, 244 West Main St., followed by burial in Howard Street Cemetery. Next articleThe greatest show on earth?